A photo of a man purported to be Wing Commander Abhinandan Varthaman is going viral on social media with a claim that “this man openly supported BJP and voted for Narendra Modi”. The text in Hindi along with the photo states :“विंग कमांडर अभिनंदन जी ने खुलेआम बीजेपी का समर्थन किया है और वोट भी डाला है मोदी जी को प्रधानमंत्री बनाने के लिए और इनका कहना है वर्तमान में मोदी जी से अच्छा प्रधानमंत्री कोई दूसरा नहीं हो सकता दोस्तों पहुंचा दो जिहादियों और कांग्रेसियों तक तुम किसी जवान को जिंदा वापस ना ला सके”. The post has been shared by various right wing groups in facebook too. Here are screenshots of several Facebook pages that shared the post. 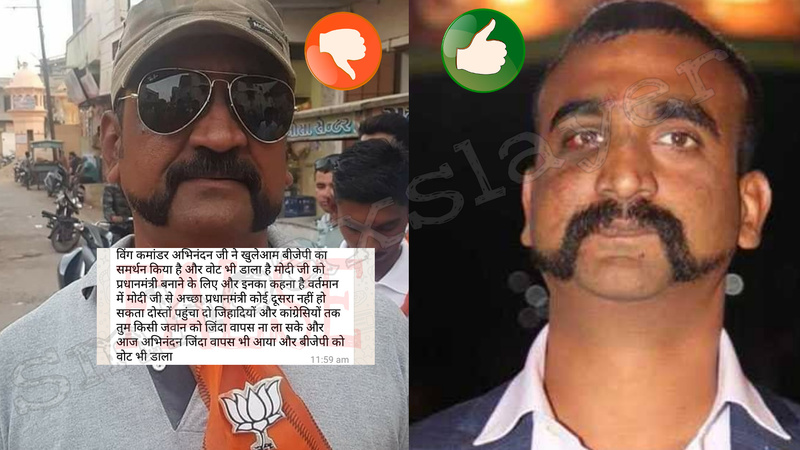 Although the source and truth of the Photo couldn’t be found on the net, SMHoaxSlayer tried to find out the difference between the original photo of Wing Commander Abhinandan Varthaman and the purported image and found that there are several differences between the original photo and the purported photo. 1) Wing Commander Abhinandan Varthaman has a mole below the left side of the lower lip . But the purported image as one under his right eye. Moles can’t shift places on face like this LOL. 2) Wing Commander Abhinandan Varthaman’s nose is sharper than the purported image of Varthaman. 3.) समोसा सेण्टर/Samosa Center is written on the shop behind this man, It’s written in Gujarati while In Tamil Nadu, language would be different. Moreover Varthaman stays at Chennai and so he is expected to vote from Tamil Nadu. Tamil Nadu is going for the polls on third phase. Around 39 Parliamentary constituencies of Tamil Nadu are going for the polls on April 18, 2019. The story has been debunked by BOOMLIVE too. The boy wasn’t sacrificed in the shocking procession video. October 20, 2018 Hoax Slayer Comments Off on The boy wasn’t sacrificed in the shocking procession video. No! Sachin Pilot did not blacken Narendra Modi’s face! January 8, 2019 Shoubhik Ghosh Comments Off on No! Sachin Pilot did not blacken Narendra Modi’s face! March 19, 2019 Hoax Slayer Comments Off on Missing Najeeb is not in the viral ISIS photo.